Late afternoon before the crowds build. Magic Rock - BA de Mole 10.00 Brewed in collaboration with de Molen and kegged in some way. It is fabulous. Black, with chilli and spice and dusty old wood. Magic Rock - Bearded Lady 10.50 A rare treat indeed to find this Imperial Stout in cask. Sublime. Magic Rock - Conjurer 3.50 A Pale Ale with a very hoppy nose. Biscuity malt and a floral and citrus hop taste. Magic Rock - BA El Gingero 7.50 From some form of keggery. A strong, barrel-aged Oatmeal Stout with ginger and orange. There is nothing wrong with the two cask beers available here tonight – two of my absolute favourites in fact – but I need a slow, sippin’ kind of beer whilst my body deals with a large overload of nachos from the previous pub. La Senne - Brussels Calling 6.50 A cloudy, golden IPA – everyone is brewing them. Fragrant and bitter. On to Beer Merchants where a group of friends is ensconced. It is Tiny Rebel week or Tiny Rebel month or something and good to see a couple of their interesting beers on cask as well as a line of key-keg taps. Tiny Rebel - Strawberry Milkshake 4.20 Less lactose than the Nelson Milkshake beer and lots of strawberry. Better balance in my opinion. Tiny Rebel - Fields Forever NEIPA 6.50 From key-keg. Murky gold. Amber, sweet, milky, strawberry. Tiny Rebel - Nelson Sauvin Milkshake IPA 4.20 Murky pale gold, a lot of lactose, bit of grapefruit. Tiny Rebel - Club Tropicana 5.40 From key-keg and a bit too much carbonation has built up for my tastes. Hazy gold, with lots of tropical fruit flavours. Busy on Sunday early evening, although nothing compared to the crowds at nearby Crate and Howling Hops – one look at those and I moved on. Northern Monk - Sharknado 5.50 From key-keg. Orange in colour. This is an IPA, flavoured with sea salt and blood orange. It is fantastic. My friend starts to get annoyed by my repeated comments about how fantastic it is. Beavertown - Zoltar Says “Make Your Wish” 7.50 From key-keg. Another superb beer. This one is a white wine barrel-aged Stout. English hops and Irish yeast. Tiny Rebel - Cwtch 4.60 The sole beer on cask today, but it’s a cracker. Kona Brewing Co. - Hanalei IPA 4.50 From keg dispense and a bit fizzy. A rather dry, fruity, pale IPA. Whilst everyone was sitting with their coats on as far from the door as possible when I visited a couple of weeks ago, tonight they are all out in the yard wearing T-shirts. Tiny Rebel - The Vader Shuffle 6.50 A black, barrel-aged Porter brewed with Belgian yeast. Oak and spice and toffee. Special stuff. Lost and Grounded - Running with Spectres 6.80 From key-keg. A Baltic-style Porter. Good strength. Black, rich and dry, with chocolate flavours. I’ve read a lot about this place recently and was pleased to make a first visit. Very impressive. For some reason I shunned a favourite cask beer to try a couple of the keg thingies. Lervig - Easy DDH IPA 4.50 From a keg of some kind. A wonderful, murky, golden IPA with Mosaic and Citra. Verzet - Oud Bruin Raspberry Harvest 2017 6.00 From a keg of some kind. Dry and woody and fruity and sour and expensive. The pub is found in Hackney, Greater London, E9 5LN. 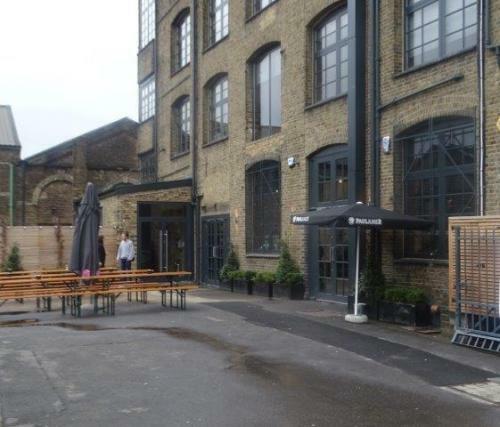 A very large new bar, opened in former industrial premises close to Hackney Wick Station in early 2018. There is a large, split-level main bar, with another big room beyond and a courtyard seating area at the front. Beer sold in a variety of formats, including through 20 taps and two handpumps on the bar. We have visited this pub 6 times, seen 20 different beers and tried 17 of them.